‘Sexist Trousers’ – Bad Move or Smart Marketing? ...the most dangerous place to be is ‘plain vanilla’ because you don’t stand out and people forget about you. 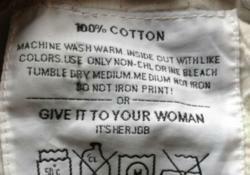 On March 6, 2012, social and online media created a frenzy over Madhouse’s controversial washing label that outlines how you should wash the trousers following with: “Or GIVE IT TO YOUR WOMAN. It’s her job.” Marketing expert, Charles Gaudet, said that while many people were justifiably angered by this comment, the company also received immense support from (mostly men) who thought the label was funny. By taking an aggressive stance for something – whether it’s a design style, specific target market, belief, challenge of the status-quo – entrepreneurs separate themselves from being average and, as a result, tend to inspire a loyal group of followers. 1. Richard Branson with his “Virgin” brand and his uncharacteristic style of leadership. 2. Hooters restaurant chain with its blatant sexual appeal. 3. Steve Jobs and his constant vigilance to fight against the technology status-quo. 4. Donald Trump and his aggressive stance in politics, leadership and what it takes to succeed. 5. Atkins and the controversial belief that ‘fat’ is good for you.